When the Turing based RTX series launched in October, zero games supported RTX technology. However, that finally changed with this new RTX focused patch for Battlefield V, the world's first RTX compatible game. However, "RTX on" doesn't come very cheaply to Turing GPUs. The main selling point for the brand new RTX series of GPUs from Nvidia was that they could ray trace in real time and make games look incredibly realistic. While the latter is definitely true, Nvidia seems to have used a very generous consideration of what is "real time" for ray tracing in games. According to reviewers, RTX performance in Battlefield V (or BFV) when enabling RTX settings is very low, in some cases turning a playable experience into a stuttering mess. 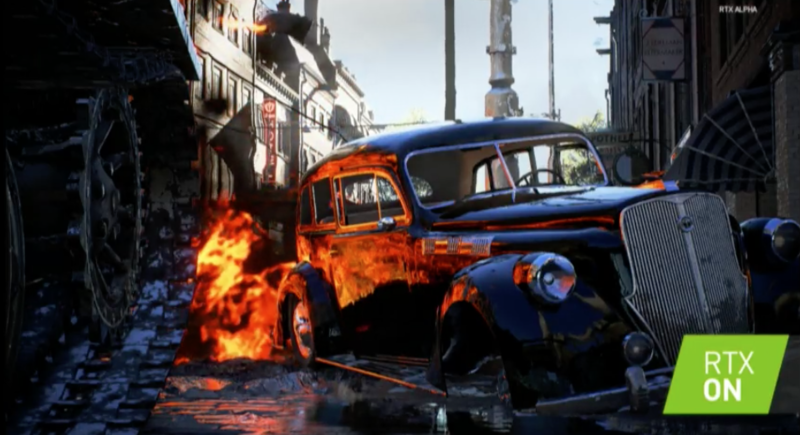 Users could see their performance getting cut in half or even worse depending on how high they crank up the new ray tracing settings, what resolution they play at, and what card they're using. Tim Schiesser of Hardware Unboxed and Techspot took a look at how all three RTX GPUs performed and found that the new RTX graphics were quite realistic and well done aside for some reflections which were rather blocky and pixelated or in other cases where reflections were reflecting objects that didn't exist like godrays. However, Schiesser found that performance was "absolutely horrendous even if you have a flagship RTX 2080 Ti." Performance wasn't even good enough to test at 4K, as ray tracing performance scaled worse the higher the resolution was. The 2080Ti could not even muster 60 FPS at 1080p with ultra settings for everything including ray tracing. Turning ray tracing down to low allowed the 2080Ti to perform at 72 FPS but turning it off entirely allowed the 2080Ti to reach 150 FPS, a 108% increase in framerate. We’d be bitterly disappointed if we bought an RTX 2070 for ray tracing, only to be left with that sort of performance. Nvidia should have been far clearer about what to expect from ray tracing when they announced their new GPUs. It’s all well and good to announce real time ray tracing as a major new feature, but buyers are going to be disappointed when they purchase a $1,200 product only to find out using that feature results in awful performance. If ray tracing had been presented as more of a look into the future, rather than a feature ready for prime time in today’s games, it’d be much easier to swallow what is being dished up in this initial release. However, Schiesser did express hope that the RTX technology would mature and get better with time. The visuals are impressive, nobody can deny that, but as things currently stand, performance isn't good enough for gaming and the visual quality doesn't justify the inability to play BFV at 1080p and 60 FPS on a $1200 GPU. For now, perhaps RTX should be left off, but in the future we are eager to see how RTX evolves since the visuals the technology provided in BFV were great.